Green chile cornbread is an excellent side to any of Desert Garden's soups! Quick and easy to make (all you'll need to add is milk, egg and oil). 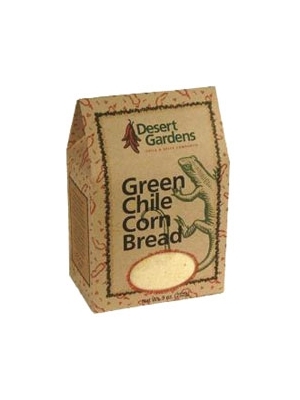 Desert Gardens Green Chile Corn Bread is moist and delicious cornbread delivers that special Southwestern kick to any meal! Sugar, Flour, Baking Powder, Corn Meal, Dehydrated Green Chile, and Salt. Best cornbread, great with the green chili stew. You can even add additional green chili and the cornbread still comes out great!! !